Drawing A Blank: The Art of Cody Schibi: Happy ThanksGiveaway!! The day is almost here where we hang out with family & friends, gorge ourselves with as much food as humanly possible, take a nap, then DO IT ALL OVER AGAIN! 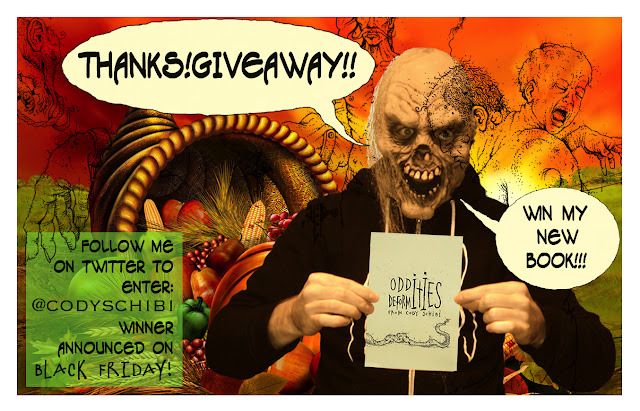 There's a lot to give thanks for this year, but ONE thing I'll be giving away is my new art book: 'Oddities/Deformities'! This little "contest" is running a whole week with the winner being announced the day after our food comas on BLACK FRIDAY! All you have to do is give me a follow on Twitter & ReTweet the tweets I'll be periodically putting up from here until next Friday...THAT'S IT! I'll be randomly selecting one of my followers who retweeted the goods & sending them out a book with something special scribbled in it. If you just can't wait or feel you're the unluckiest person in the world & in NO WAY will you win this giveaway, I have put my book up in my online store. Head over there & start your XMAS shopping from the comfort of your home! The Monsters Have Been Caught...& NOW RELEASED!! Austin Comic Con is here already? !...CACA!